Elite Boxing launched the 2017 Season of its EFN Series last Friday with an action-packed double header event in Kuala Lumpur, Malaysia. 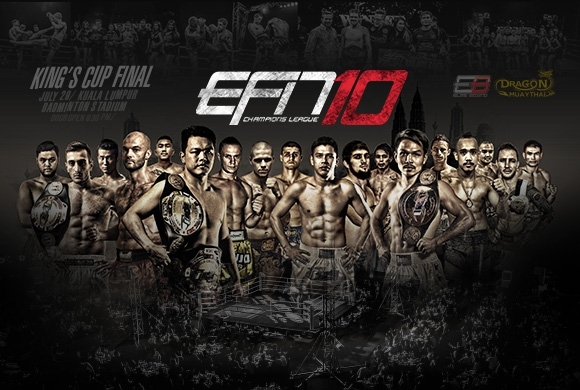 Featuring two 4-man tournaments at the 66kg and 72kg weight divisions as well as 5 exhibition super fights at various weights, the event included the rearranged EFN 10, which had been postponed at the end of last year due to the unfortunate passing of the Thai King, HM Bumiphol Adulyadej, together with EFN 11, the first event of the 2017 Series. The night's action got undewrway with a 57kg exhibition bout between local fighter Iwan Merican and Nontachai Kiatkorwit of Thailand. Despite his best efforts and the vocal support of the home crowd, the Malaysian lost a narrow fight by decision to his Thai opponent. The Thais continued their good start to the evening when Addy SS Fighter overcame Arthur Meyer of France in the 59kg exhibition fight on a decision, and it was to become a hat-trick of Thai victories when Yodsila Team X overcame Dmitrii Mordvinov of Russia with a vicious left hook that earned the Thai fighter a TKO in this 61kg bout. With the crowd warmed up, the action moved on to the launch of the EFN 2017 Series. The 4-man 66kg tournament got underway with the first semi-final featuring Amir Naseri of Iran taking on Yodsiam Fairtex of Thailand. The bout exploded into action right from the beginning as the Iranian took the fight to his Thai opponent, and it was a strategy that paid off as Naseri earned a TKO against Yodsiam when he connected with a flying left knee in the first round. The second 66kg semi-final featured Alex McGregor of Scotland and Kim Dong Hwan of South Korea. With little between the two fighters, the bout went all the way with the Scot just edging the fight on a decision to earn his place in the final against Naseri. The action moved onto the 72kg division next with the first of the two semi-finals of the rearranged EFN 10 event. Thiraphong Kiatkorwit of Thailand succumbed to a well-placed right hook from Ukrainian fighter Moisa Muaythai Academy in another fast and furious bout. It was England versus Brazil in the second 72kg semi-final as Kurtis Allen took on Willian Silva for the right to meet Moisa in the final. Both fighters put on a technical display, but it was Englishman Allen who took the honors with a TKO in round 2 after connecting with a left knee. The heavyweights took centerstage next as local bruiser Ewan Bigboyz delighted the home crowd by overcoming Super Benz Elite Fight Club of Thailand with a right elbow in the third round. Amir Naseri and Alex McGregor stepped into the ring next for the 66kg final of EFN 11. Neither fighter would give way in a hard-fought encounter, but it was to be the Iranian who took the glory with a decision victory over his Scottish opponent to earn his place in the final of the EFN 2017 Series. There was time for one final exhibition fight as Mardsua Tum of Thailand overcame Piotr Lagodzki of Poland by decision. The last action of a thrilling evening's entertainment saw Moisa Muaythai Academy of Thailand and Kurtis Allen of England go head to head for the 72kg crown. The Englishman gave a spirited performance but was ultimately outfoxed by his Thai opponent who connected with a knee in round 3 to earn a TKO and take the delayed EFN 2016 Series Title.